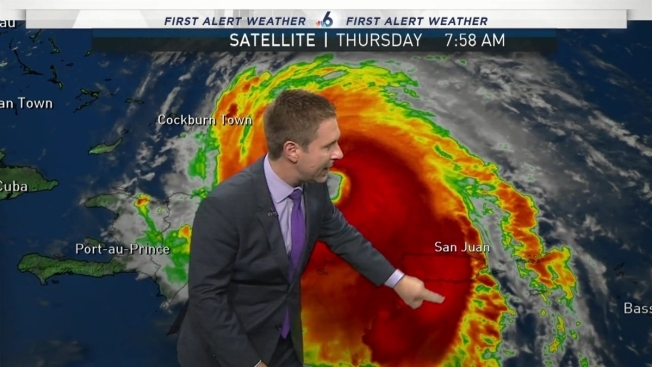 NBC 6's Adam Berg has the latest update on the storm and where additional watches and warnings have been issued. Rescuers fanned out to reach stunned victims Thursday, and millions of Puerto Ricans faced the dispiriting prospect of weeks or even months without electricity after Hurricane Maria ravaged the island. 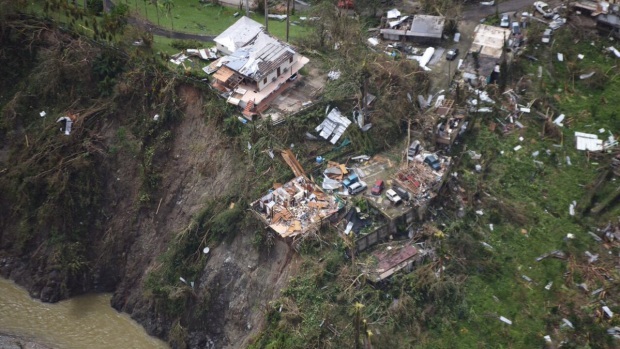 Maria's death toll across the Caribbean climbed to at least 19, nearly all of them on the hard-hit island of Dominica. 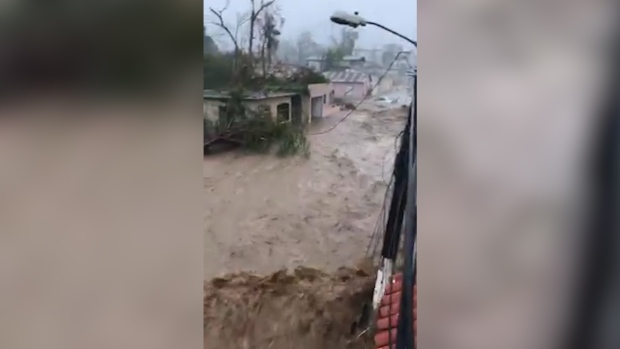 Uprooted trees and floodwaters blocked many highways and streets across the island of 3.4 million people, creating a maze that forced drivers to go against traffic. Some people resorted to rafts and kayaks to get around. Police used loudspeakers to warn people about a 6 p.m.-to-6 a.m. curfew imposed by the governor. Crumbled red roof tiles lay scattered across many roads, and residents sidestepped or ducked under dozens of black power lines. Officials were unable to say when electricity would return. President Donald Trump approved a federal disaster declaration for the island, which got sideswiped by Hurricane Irma two weeks ago. As of Thursday afternoon, Maria was moving off the northern coast of the Dominican Republic with winds of 120 mph (195 kph). The storm was expected to approach the Turks and Caicos Islands and the Bahamas late Thursday and early Friday. From there, it is expected to veer into the open Atlantic, no threat to the U.S. mainland. Maria knocked down trees and power lines in the Dominican Republic. But Joel Santos, president of the country's hotel association, said the hurricane did not damage the tourism infrastructure, even though it passed close to Punta Cana, the major resort area on the eastern tip of the island. In the Puerto Rican capital of San Juan, towering eucalyptus trees had fallen nearly every other block over a main road dotted with popular bars, restaurants and coffee shops, some of them damaged. Outside an apartment building, 40-year-old tourism company operator Adrian Pacheco recounted how he spent eight hours in a stairwell huddled with 100 other residents when the hurricane ripped the storm shutters off his building and wrecked three balconies. "I think people didn't expect the storm to reach the point that it did," he said. "Since Irma never really happened, they thought Maria would be the same." The slog back to normalcy was in evidence Thursday, however, as residents removed storm shutters and lines began forming at the few restaurants with generator power. The sound of chain saws and small bulldozers could be heard across San Juan as firefighters removed trees and lifted toppled lamp posts. Some neighbors pitched in to help clear the smaller branches, including Shawn Zimmerman, a 27-year-old student from Lewistown, Pennsylvania, who moved to Puerto Rico nearly two years ago. "The storm didn't bother me," he said. "It's the devastation. I get goosebumps. It's going to take us a long time." 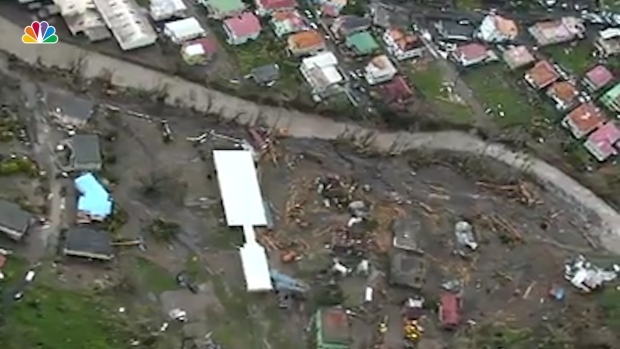 Maria was blamed for at least 15 deaths in Dominica, two in the French Caribbean territory of Guadeloupe, and two more in Puerto Rico, including that of a man whose boat got caught in the storm off the island. Three people were rescued from the capsized vessel. "It is a miracle there were not hundreds of deaths," he said. He said his country is "going to need all the help the world has to offer." Even before Maria and Irma knocked out power to millions, Puerto Rico's electrical grid was in sorry condition because of a lack of maintenance and a dwindling staff. The island has also been mired in a financial crisis that has resulted in tough austerity measures. Edwin Rosario, a 79-year-old retired government worker, said the financial crisis that has sparked an exodus of nearly half a million Puerto Ricans to the U.S. mainland will only make the recovery harder. "Only us old people are left," he said as he scraped debris from the gutter in front of his house. "A lot of young people have already gone. ... If we don't unite, we're not going to bounce back."